Oligodendrogliomas are gliomas that arise in the cerebral hemispheres of young and middle-aged adults. The tumors have a propensity to arise in the gray matter or superficial white matter of the frontal lobes, but oligodendrogliomas may also arise in other regions of the central nervous system. These tumors have recently been demonstrated to have a frequent occurrence of loss of heterozygosity for the short arm of chromosome 1 and the long arm of chromosome 19 that, when present, are associated with a good chemotherapeutic responsiveness. These tumors are designated by the World Health Organization (WHO) as grade II tumors  ; however, oligodendrogliomas are prone to progress to WHO grade III and cause death. Occasionally a tumor may be encountered with an astrocytic component. 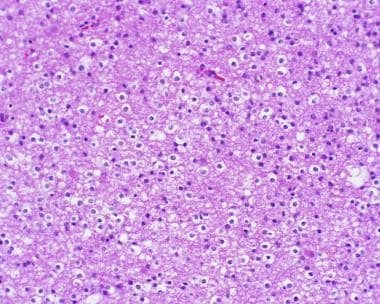 Such cases, sharing both oligodendroglial and astrocytic features, are called oligoastrocytomas (see the following image). This tumor exhibits oligodendroglial-type nuclei and scanty eosinophilic fibrillar cytoplasm amidst a mucinous background. Such tumors may be considered oligoastrocytomas. Little is known of the cause(s) of oligodendrogliomas; no pattern of inheritance or familial risk for developing these tumors is known. Oligodendrogliomas preferentially arise in the cerebral hemispheres of young and middle-aged adults. Histologically, the tumors predominately affect the gray matter or superficial white matter of the frontal lobes. Although these tumors may also arise in other regions of the brain and spinal cord, the latter is rare. There are no specific laboratory tests that are helpful in making a diagnosis of oligodendroglioma. Oligodendrogliomas at presentation are well-delineated, cortically based tumors that, less commonly, may have surrounding edema and may even erode the inner table of the skull. The computed tomography (CT) scan density of the neoplasms at presentation can be either low and attenuated or mixed, isodense, and hyperdense. Grossly, the oligodendroglioma tumors are grayish pink, soft, but often well defined. On sectioning, oligodendrogliomas are seen to arise in the superficial aspects of the cerebral hemispheres, occasionally extending to the subarachnoid space as a creamy white mass resembling toothpaste to the operative surgeon. Occasionally, the tumor may arise in the deeper gray matter. The biological reason for the preference of the tumor to arise in the frontal lobe is unknown, but it is not restricted to this lobe. Bilaterality is associated with crossing of the corpus callosum, and a tendency to spread by subarachnoid or subpial infiltration, in contrast to astrocytomas, in which the astrocytic tumor cells follow the parenchymal white matter tracts. Mucinous change is occasionally noted and may be so extensive as to confer a gelatinous appearance to the tumor. The oligodendroglioma derives its name from its close histologic resemblance to the benign oligodendroglial cell, with round, central nuclei and oval, water-clear cytoplasm (see the image below), which has been likened to the fried egg with its yolk. 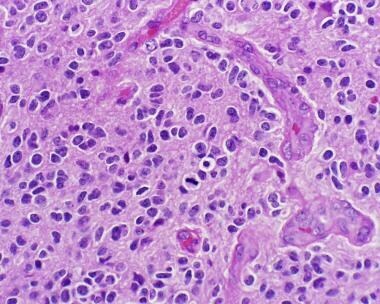 The classic appearance of the oligodendroglioma is that of a round to oval, water-clear cytoplasm ringing about round to lobulated nuclei. The chromatin appearance is finely threadlike to smudgy, often associated with pointlike basophilic chromocenters, rather than nucleoli. The tumor cells often form dense, hypercellular masses in the subcortical white matter, and they also have a propensity to aggregate around blood vessels and neurons ("satellitosis") in regions of cortical infiltration (see the following image). The cellular density is moderate to high, and the fried-egg appearance dominates the histologic features. Oligodendrogliomas are often associated with delicate arcuate vessels; however, this feature can also be encountered in ischemic cortex and may represent a reaction to tumoral ischemia rather than a nascent feature of the tumor itself. Another histologic feature commonly encountered is the formation of minigemistocytes, characterized by tumor cells with small eccentric droplets of eosinophilic cytoplasm about the size of the nucleus. These glial fibrillary acidic protein (GFAP)-immunoreactive cells have no prognostic significance. Rarely, the tumors may exhibit a focal granular eosinophilic change in the cytoplasm of some cells; such a change also has no diagnostic or prognostic utility. 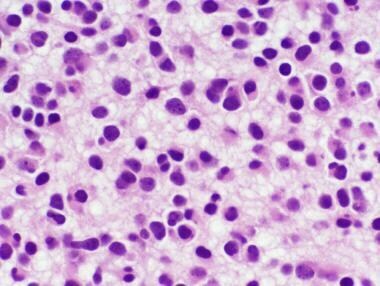 Fresh cytologic smear preparations of oligodendrogliomas exhibit delicate vessels with small, round nuclei clinging to the vessels. The tumor cells also lack significant cytologic processes. 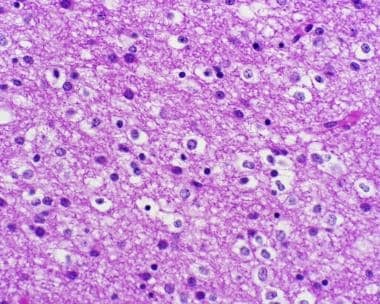 Occasionally, a tumor may be composed of a mixed population of round nuclei and elongated nuclei having fibrillar cytoplasm and exhibiting satellitosis, or it may demonstrate geographically separate and distinct regions of oligodendroglial and astrocytic (oval to elongated nuclei) morphology (see the following image). Such tumors are best classified as mixed oligoastrocytomas. There are no specific markers for oligodendrogliomas that can be relied upon to make a diagnosis. However, the tumors are immunoreactive for S100 protein and microtubule-associated protein 2 (MAP2). The transcription factor Olig2, although expressed in oligodendrogliomas, remains nonspecific as an oligodendroglial marker. Recently, alpha-internexin  and nogo-A  have been described as markers that appear to correlate with 1p/19 loss status, a marker of good therapeutic response and found in 80% of oligodendroglial tumors. Oligodendrogliomas are largely well circumscribed, but these tumors may occasionally be associated with local multilobar invasion/infiltration to present as gliomatosis cerebri. Distant spread via the cerebrospinal fluid (CSF) is unusual in most gliomas. Oligodendrogliomas that are associated with a poorer survival include those tumors that exhibit necrosis, significant mitotic activity, and vascular proliferation (see the image below). Oligodendrogliomas with vascular proliferation and significant mitotic activity are best considered to be anaplastic oligodendrogliomas (World Health Organization [WHO] grade III). 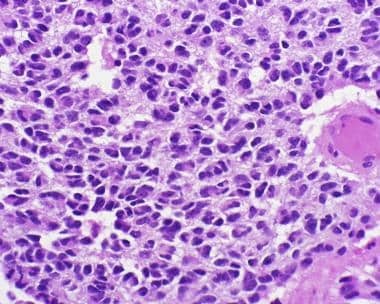 Anaplastic oligodendrogliomas frequently take on eosinophilic cytoplasm and hyperchromasia of the nuclei. Such tumors may demonstrate necrosis among its diagnostic features. Louis DN, Ohgaki H, Wiestler OD, Cavenee WK, eds. WHO Classification of Tumours of the Central Nervous System. Lyon, France: IARC Press; 2007. Central Brain Tumor Registry of the United States. Supplement Report: Primary Brain Tumors in the United States, 2004. 2008. Mork, S. J., Lindegaard, K. F., Halvorsen, T. B., et al. Oligodendroglioma: incidence and biological behavior in a defined population. Journal of Neurosurgery. Dec. 63:881-9. [Medline]. Giannini C, Scheithauer BW, Weaver AL, et al. Oligodendrogliomas: reproducibility and prognostic value of histologic diagnosis and grading. J Neuropathol Exp Neurol. 2001 Mar. 60(3):248-62. [Medline]. Davis FG, Freels S, Grutsch J, Barlas S, Brem S. Survival rates in patients with primary malignant brain tumors stratified by patient age and tumor histological type: an analysis based on Surveillance, Epidemiology, and End Results (SEER) data, 1973-1991. J Neurosurg. 1998 Jan. 88(1):1-10. [Medline]. McLendon RE, Herndon JE 2nd, West B, et al. Survival analysis of presumptive prognostic markers among oligodendrogliomas. Cancer. 2005 Oct 15. 104(8):1693-9. [Medline]. Giannini C, Burger PC, Berkey BA, et al. Anaplastic oligodendroglial tumors: refining the correlation among histopathology, 1p 19q deletion and clinical outcome in Intergroup Radiation Therapy Oncology Group Trial 9402. Brain Pathol. 2008 Jul. 18(3):360-9. [Medline]. Eigenbrod S, Roeber S, Thon N, Giese A, Krieger A, Grasbon-Frodl E. a-Internexin in the diagnosis of oligodendroglial tumors and association with 1p/19q status. J Neuropathol Exp Neurol. 2011 Nov. 70(11):970-8. [Medline]. Marucci G, Di Oto E, Farnedi A, Panzacchi R, Ligorio C, Foschini MP. Nogo-A: a useful marker for the diagnosis of oligodendroglioma and for identifying 1p19q codeletion. Hum Pathol. 2012 Mar. 43(3):374-80. [Medline]. Jenkins RB, Blair H, Ballman KV, et al. A t(1;19)(q10;p10) mediates the combined deletions of 1p and 19q and predicts a better prognosis of patients with oligodendroglioma. Cancer Res. 2006 Oct 15. 66(20):9852-61. [Medline]. Bettegowda C, Agrawal N, Jiao Y, Sausen M, Wood LD, Hruban RH, et al. Mutations in CIC and FUBP1 contribute to human oligodendroglioma. Science. 2011 Sep 9. 333(6048):1453-5. [Medline]. [Full Text]. Yip S, Butterfield YS, Morozova O, Chittaranjan S, Blough MD, An J, et al. Concurrent CIC mutations, IDH mutations, and 1p/19q loss distinguish oligodendrogliomas from other cancers. J Pathol. 2012 Jan. 226(1):7-16. [Medline]. [Full Text]. Killela PJ, Reitman ZJ, Jiao Y, Bettegowda C, Agrawal N, Diaz LA Jr. TERT promoter mutations occur frequently in gliomas and a subset of tumors derived from cells with low rates of self-renewal. Proc Natl Acad Sci U S A. 2013 Apr 9. 110(15):6021-6. [Medline]. McLendon RE, Rasheed A, Wiltshire R, Herndon J. Correlation of 1p-19q-defects in human gliomas with the light microscopic appearance of oligodendroglioma. Mod Pathol. 2004 May. 17(5):604-5. [Medline]. [Full Text]. Pohl U, Cairncross JG, Louis DN. Homozygous deletions of the CDKN2C/p18INK4C gene on the short arm of chromosome 1 in anaplastic oligodendrogliomas. Brain Pathol. 1999 Oct. 9(4):639-43. [Medline]. Scheithauer BW, Fuller GN, VandenBerg SR. The 2007 WHO classification of tumors of the nervous system: controversies in surgical neuropathology. Brain Pathol. 2008 Jul. 18(3):307-16. [Medline]. The author would like to acknowledge Dr. Thomas J. Cummings, Dr. Linda Gray and Dr. Allan Friedman for many fruitful collaborative discussions on this topic. Dr. McLendon is supported by grants from NIH 5P50CA108786; NIH P50NS020023; the Pediatric Brain Tumor Foundation; and the Pediatric Brain Tumor Consortium.